Love Bombs has pink and silver glitter, fine blue shimmer, and a scattering of blue hearts in a clear base. 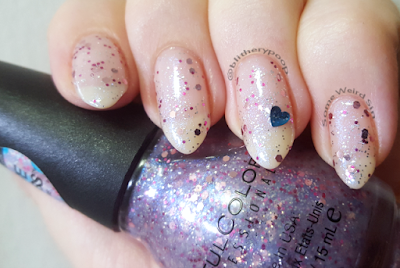 This is how you do shape glitter if you don't want to pack a polish with it. Star Studded from last year's holiday collection (never made it onto the blog, but see it on IG) had a similar complexity. Love Bombs doesn't have nearly as many hearts as Star Studded has stars. I really had to work to get that single one out...but I'm ok with that. Shape glitter toppers can very easily become overkill. 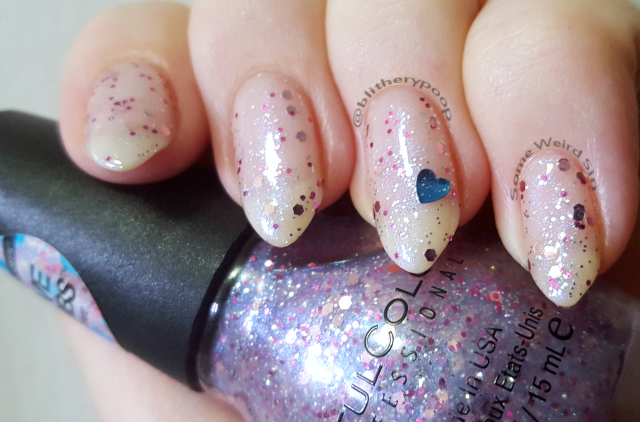 The shimmer and variety of other glitter keeps Love Bombs from feeling skimpy or boring. Application was easy too. Bottom line: Lots of laying potential. Plenty of visual interest. Not all that many hearts. Have you seen this Valentine's Day display at Rite Aid, Walgreens, or Target yet? I bought this bottle at Wegmans, and haven't seen it anywhere else so far.